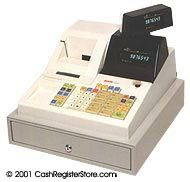 Sanyo ECR-340 Electronic Cash Registers at Cash Register Store. The Sanyo ECR-340 provides today's retailers with one of the most-cost-effective Electronic Cash Registers in its class. With an extended feature package and stylish cabinet design, it offers excellent performance value. The ECR-340 is a durable, reliable solution to your electronic cash register needs. This cash register features an alphanumeric dot matrix printer with validation, and heavy duty 5 bill, 10 coin cash drawer. The ECR-340 is a nice choice cash register for a small grocery or convenience store. Dot Matrix printer, 3.3 lines per sec.